When thinking of Greece, many images come to mind including the Acropolis, the Olympics and the beautiful Greek Isles. When Greece joined the European Union, the world was introduced to even more products from this beautiful country and its rich culture. I must confess my knowledge of Greek wines was fairly limited until recently. My friends and I have been exploring Greek cuisine and wines. I was delighted to find that the quality of Greek wines has dramatically improved from prior tastings, which prompted some delightful research. With early signs of winemaking traced back to 6,500 years ago, Greece is clearly one of the oldest wine regions in the world. Wine played a role in spreading Greek culture throughout the Mediterranean because their wines were in demand. Dionysus, the Greek god of wine, developed a loyal following with wine lovers. Greek wines were also favored by the Roman Empire, which further developed the wine trade. Greeks helped pioneer wine production in Spain, southern France and Italy. In the 1960s in the United States, Retsina and Roditis symbolized Greek wine. They were not the best ambassadors for Greece, as these high volume wines were lower quality. 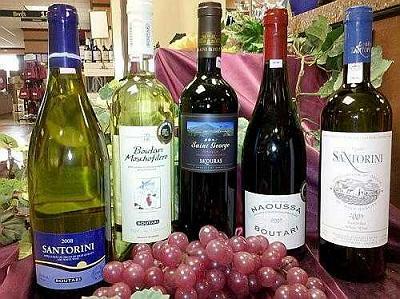 Today, the Greek wine industry is undergoing change. Both new winemakers and established wineries are emphasizing lower yield, higher quality wines. Combining Greece wonderful climate and distinct Terroir (the volcanic soil on Santorini) with modern winemaking techniques helps the new breed of winemakers produce world-class wines. These winemakers are moving to an international style by also producing cabernets, merlots, chardonnays and viogniers. Important winery names to keep in mind include Boutari, Skouras, Lazaridis and Sigalas. There are hundreds of grape varietals used in wine production in seven major wine regions. These include wine regions on the mainland (Peloponnese, Macedonia, Thessalia and Epirus) and several island groups (the Aegean Islands, Crete and the Ionian Islands). There is inadequate newspaper space to do this topic justice, so I decided to focus on some wines included on local restaurants wine lists and also available for sale at local wine merchants.